At last, i managed to photo shoot a series of portrait for my friend. The differences are it was a Chinese face. 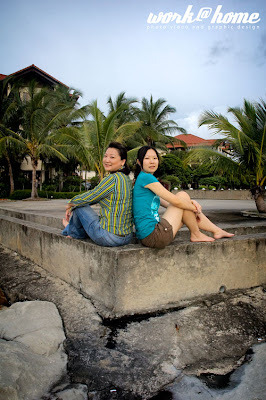 I have been doing lots of mix Chinese, Dusun, Timorese and Kadazan for my portrait session. 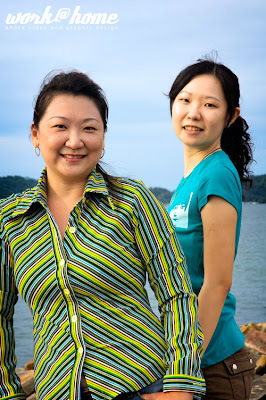 I hope to get more difference faces and different theme such as mother and daughter, friends, sisters and guys portrait. 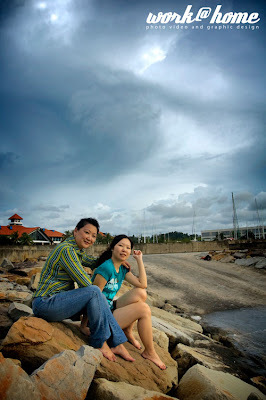 The weather was not really good but ideal for soft light especially for portrait to avoid any hard shadow on the faces. I return again to my favorite spot at Sutera Harbor Marina for the session and started with a simple pose because they not really used being photographed previously. Romina contributed some pose idea and it turn out great. yeah.. i agree. still more to come. duh… i know Karen.. she is my ex classmate . hehe..
Jeff…I don;t know but I am seriously think you need to cover the weakness . 1st photo, You make Romina look Fat at the 1st photo, see the tummy see the double chin, Karen also looks weird. I don’t know about her but mostly ppl hate that especially F, which mostly M doesn’t seem care about it. I had seen other of ya great works, but this is not a “WOW” . yaka.. karen was your classmate ka? waw..
ya.. lots of weakness in this photos and i still analyzing and spotted lots of weakness that i missed especially with the iso, flash setting and shutter speed. this was a first casual portrait for them both and not really know how to pose like you and pat. it depends to their own mindset, everyone got their own beauty and attraction. if everyone start to dislike double chin and tummy on the photo, it might be quite hard to see any good and pretty chubby and fat people portrait in the market then. of coz, this is not my “WOW” works. i just want to warm up my camera and get my photography basic over again and get back using to see the details during photo session. i still waiting for another happy days portrait session. i still looking for someone who can be very confident in front of the camera lens without worrying about their body or face look that might make the photo look a bit dull. yes, romina have a photogenic face. she have a long lasting face that look great no matter she’s chubby or older. yes, i know it just what you think. you can say what you think as i can say what i think too.. comment is good to improve one knowledge and skills that one can’t see by him/her self.